Ben and Jerry’s Week is still a-go. Round one was fun with What A Cluster Bars, Cherry Garcia Cake and Phish Food Pie. Round two, we’re getting a little scandy. Karamel Sutra? I mean, Ben. And. Jerry. I’m blushing. Let me explain what Karamel Sutra Ice Cream is. Think chocolate and caramel ice cream with fudge chips surrounding a giant core of caramel. Can you even believe that is a real thing? So when we were deciding on B&J flavors to replicate this week, there was no way I wasn’t choosing the completely inappropriately named Karamel Sutra. Here’s my spin: A devil’s food cake cupcake, filled with caramel sauce, topped with a chocolate buttercream & caramel frosting swirl, garnished with completely optional, but not optional at all chocolate curls. Basically the best Chocolate and Caramel Swirl Cupcake you will ever have. It’s a lot of steps for one cupcake, I understand…and certainly there are ways to cut corners…so dissect it the way you’d like, anyway you do it, you will not be disappointed. I actually started by making the caramel filling and the frostings the day before. I did this because there is a bunch a cooling time needed for the caramel, and thought it would be easier. I started by making the caramel filling. Annnd I also completely forgot to take pictures. It’s pretty easy, just boiling some sugar and butter together for a bit, add some cream, stir and cook more and then cool. Got that? Sorry, the full instructions are in the recipe. *If you’re feeling like you don’t want to make caramel filling, you could totally use the wrapped caramels. Rule of thumb for me is 1 pound caramels + 1/2 cup heavy cream melted together make a good consistency for caramel filling. Next up I made the chocolate buttercream. This frosting, by the way is my new favorite chocolate frosting ever ever ever. I think I might devote an entire post to it next week. All you do is melt some butter and chocolate chips together. Yep, that’s it. Let that cool completely. Honestly I stuck mine in the fridge and let it chill overnight until I was ready to use it. When it is chilled it will form a solid block. Don’t worry. Just use a hand mixer, or stand mixer and beat it up. It will magically become the softest, fluffiest chocolate frosting ever. I also made the caramel frosting the day ahead, but that’s, again, because it will need to cool at least an hour before you are able to add the powdered sugar. And also because I have been all plan-aheady lately. I don’t know what’s wrong with me. Just melt your butter and sugar together, add milk, boil some more…let it cool…add powdered sugar and that’s it! Finally when you’re ready to bake, make your super simple devil’s food cake cupcakes. And by super simple, I mean literally add all your ingredients in a bowl and then mix. No creaming, no gradually adding, no alternate dry and wet.. just add and mix. The end. Your batter will be runny, but it’s ok.
Then fill your piping bag with frosting. I filled my piping bag with chocolate frosting on one side and caramel on the other…and squeezed a bit out until they swirled together. Now, let’s talk about some more Ben and Jerry’s, ok? Kristan is doing some crazzzzy Everything But the…Brownies. Yes, sir. And Peabody is also doing Everything But the… but in a totally different way. Hop over and say hi to each of these girls, they are fan-freaking-tastic! Melt butter in heavy saucepan over medium low. Add sugar and corn syrup and cook 6-8 minutes until mixture is a deep caramel color, stirring constantly. Add cream slowly while stirring and cook 2 minutes more until smooth. Remove from heat and allow to cool completely (about 2 hours). 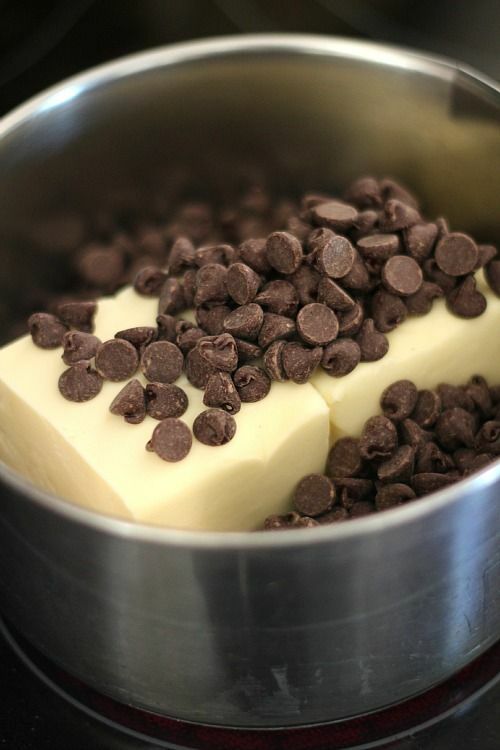 In a large saucepan melt butter and chocolate chips together until smooth. Allow to cool completely. (I let mine sit in the fridge overnight) It will become solid. 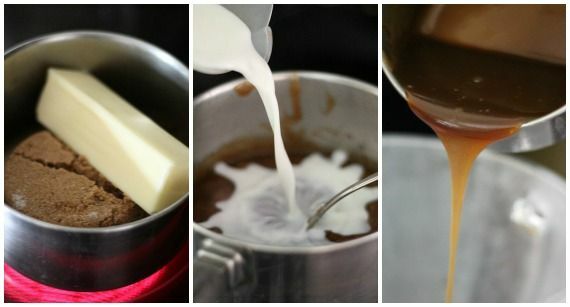 With hand mixer beat the solid chocolate until it becomes light and fluffy. In medium saucepan melt butter and sugar together. Bring to a boil and then add milk, stirring until smooth. Allow mixture to come back to a rolling boil and boil for 2 minutes. Remove from heat and allow to cool. When caramel is cool beat in powdered sugar and vanilla. Put all ingredients into stand mixer and beat for 3 minutes. 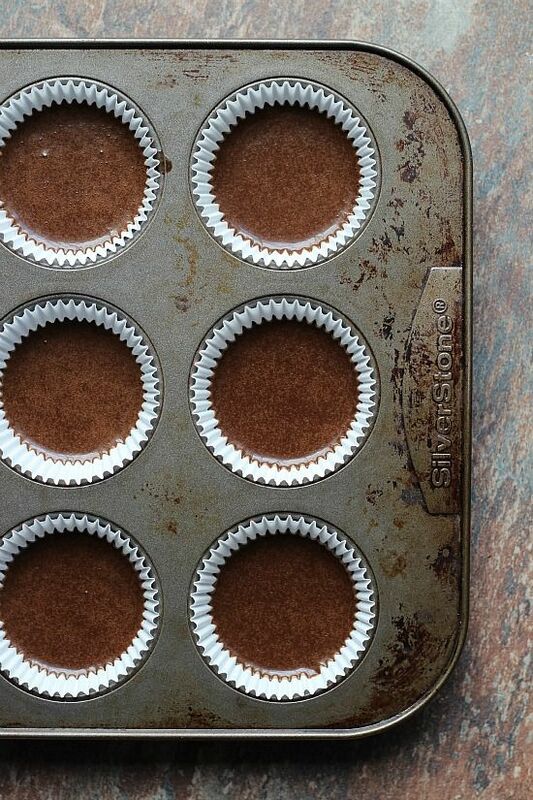 Fill cupcake liners 1/2 way full and bake for 20 minutes until the centers spring back. Cut out small portion of center of the cupcake with a paring knife. 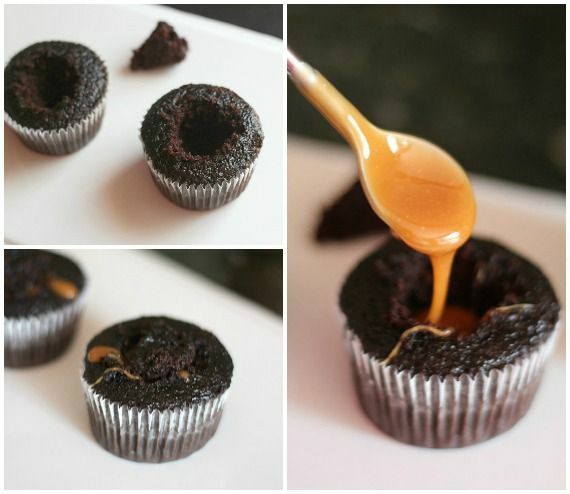 Fill cupcake with approximately 1 Tablespoon of caramel. Place cored piece of cupcake back on top. Fill a piping bag with frosting fitted with a large tip. Spread caramel frosting on one side of the bag and chocolate on the other, so when you frost the cupcakes, the frostings will swirl together. Melt chocolate chips and shortening on a small saucepan over low heat. Once melted, spread chocolate thinly on a baking sheet. Freeze chocolate for 5-10 minutes until set and using a sharp spatula push the chocolate slowly along the edges to form the curls. The chocolate curls are totally optional. You could also garnish with mini chocolate chips. Salted Caramel Cupcakes. A delicious vanilla cupcake, topped with the easiest, most foolproof caramel sauce ever, frosted with a simple caramel frosting and sprinkled with flaky sea salt! So so so good! This looks soooo lovely!! NEED! Thanks for ruining my life and showing me that ice cream….and those brownies. I’m divorcing you. You deliver right? Loving this B&J series! You guys are killing me! These desserts are absolutely amazing!! I am digging this cupcake! Digging as in a shovel…shoveling chocolate and caramel into my face, that is. I am so excited to make this. It’s like Christmas morning excitement, that’s how excited I am. These are insane!! Wow!! I want these now!! So cool! Oh my…those are downright seductive. This is the one that my fiance was looking forward to seeing what you would do with…it’s his favorite flavor. He’s loving them as am I. These cupcakes are absolutely darling! I love the caramel and chocolate! These may be the best cupcakes ever! I am intrigued by that frosting. And by intrigued, I mean I think I need to try a bowlful. You know…for quality testing and all that. These will be made this weekend, for sure! I just had to say how much I love the shot of your muffin tin. Old, worn, and well used bakeware always makes me smile. Wow wow wow is about all I can say. These look INSANELY amazing. Wow, and I love the curls of chocolate on top! Shelly…oh my WORD! Those cupcakes are beautiful!!! And why oh why have I never tried this flavor ice cream? These sound so good! I’ve never had this ice cream flavor, but I would love to try it!!! Plus, these cupcakes!!! Oh my goodness I cannot wait to make these! The perfect study treat during exam season. Chocolate and Caramel are my absolutely fave! How have I never seen this flavor of b&j ice cream!?! And you really had to show the guts- I think my drool got a little wild after seeing that picture! Wowza! I want these so badly! I have a question…when I ziplist your recipes, the image that is saved is always from an ad, not an image from the recipe. Is there any way to fix this? Thanks! You know I am working on fixing that! Thanks so much…it’s been an annoying glitch! These look wonderful – did you use a flat tip to pipe the frosting? I love the ribbon look you got! It’s actually a Wilton 1M tip! These are just so pretty to look at. good gravy this is a beautiful thing! Mmmmmm….homemade caramel! I can eat it by the spoonfuls until I’m sick! Those Are Beautiful Cupcakes! These cupcakes need to get off my screen and into my mouth RIGHT NOW. You’ve clearly gone insane in the best possible way. I absolutely must have one of these. I wonder if they have aphrodisiac qualities. I love how you interpreted the flavor. It looks so good! In the spirit of the name of the ice cream – yes, yes, yes ;). These have reminded me that I need to stock up on some Ben & Jerry’s, and I need some of these cupcakes. Genius. Wow! I love this and now I need to look for that ice cream lol. Super cute chocolate curls! I really am out of words for a cupcake this, amazing! Love the caramel in the middle. GORGEOUS cupcakes! Love the Ben & Jerry’s theme! Oh my sweet heavenly stars, friend. These look absolutely amazing <3 Wow. I'm kind of sitting over here drooling. Holy cow-yum!!! So making these! Yeah, I NEED these in my life, you had me with the caramel filling! HAPPY BIRTHDAY TO ME! Pinned…so I won’t get distracted by your next creation! Uh-huh. Yep. We need to be neighbors. You had me at caramel core. Could I use Dulche de Leche for the caramel? I bet that would be fantastic!! Karamel Sutra, hahahahaha! Once again, I have been in the dark about recent Ben and Jerry’s names but that is fan-freakin-tastic! ANd your cupcakes are gorgeous! I can’t believe chocolate buttercream would be that easy! I’m in denial. Super cute cupcakes! Also I’d do very inappropriate things to get my hands on a dozen of these. OHHH MYYYYY GOOOOODDNNNEESSSS!! !These are to die for!! Chocolate buttercream is the devil, but it is SO good! I think there’s probably some kind of internet law that prohibits me from saying what I’m thinking after eating some of the caramel as it cools. Ooooh My! ….and now I’ve just whipped the chocolate frosting up and had a taste of it WITH the caramel filling…..ILLEGAL! Making these for tonight’s high-brow book club discussion of 50 Shades of Grey. First time I ever attempted to make carame. What an interesting process that was kind-of like a science experiment and boy, does it get HOT when you mix in the whipping cream haha! It is still in the cooling stages but tastes good already so hopefully I did well. The girls are gonna love this tonight so thanks for the recipe! I can’t wait to hear how you like them!! Shelly, they were a huge hit with the book club. My friend that typically doesn’t like frosting said she LOVED the caramel version 🙂 Thanks so much! I want to make these cupcakes, I really do! But am I wrong – is there actually 3 1/2 cups of butter (almost 2 lbs) total in this recipe for 15 cupcakes? And then vegetable oil in the cupcake itself? I guess the 2 cups butter for the chocolate frosting is where my biggest hangup is – does this really work? They look absolutely crack! It’s the buttercream,, yes, it is a special chocolate buttercream that uses just butter and melted chocolate. 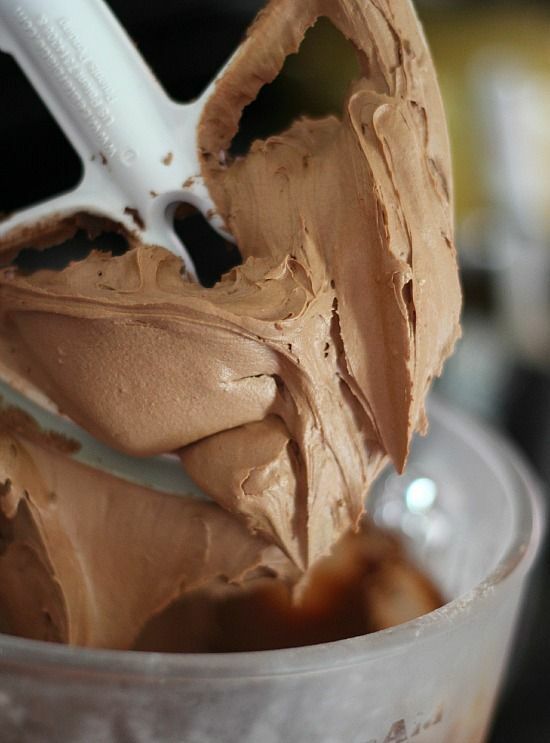 You could totally use another chocolate frosting recipe if the amount scares you! Your cupcakes look divine…can u tell me if the caramel stays in it’s original form when they sit overnight? I’m having trouble finding a caramel that doesn’t decide to hide itself into the surrounding cake and disappear- haha! Thank you!! I have had that issue too.. either it’s absorbed or it gets hard. I think my recipe will work perfect for you! Thank you!! I will let u know how they turn out- have a great sugary day! I tried making these and the caramel center does not seem like the sugar dissolved. Any suggestions? At the end of the 8 minutes before you added the cream, it was not a caramel brown, therefore, I kept it on the stove a little longer until it turned brown. It has a really good flavor, just not a good texture. I’m dying. Oh my goodness, how decadent. Hi. Im having trouble with the caramel. When i was cooking it it was perfect and smooth. But then i lwt it cool and now ita gone all grainy. Not a nice texture but the flavour is perfect. What did i du wrong or how can i stop this from happening. That’s really strange… possibly did some of the sugar stick to the sides of the pan and crystallize and you stir it back into the finished product? Or when you cook at too high of a heat, the sugar can crystallize. My tip would be turn the heat down a bit and don’t scrape the sides of the pan. Hope this helps! This sounds devine. Do you have a temperature that the Caramel should come to, to ensure that it doesn’t go grainy? I made these cupcakes yesterday for a birthday party. In the end they wee amazing and I was told multiple times that they were the best cupcakes they have ever eaten. I loved hearing those comments being a 14 year old baker. I love these cupcakes but there were some things that were kind of tough. The main thing is the chocolate frosting. When you pull it out of the fridge it is a solid block and take forever to get it to the fluffy butter cream it is supposed to be. Then when you get it to the right consistency it tastes incredibly salty from all of the butter. Since I did not want that on my cupcakes I added 1 cup of powdered sugar which fixed it and made it a wonderful frosting. If anyone who wants to make these cupcakes is reading this I recommend having a lot of time on your hands because there is a lot of steps and when you are making the chocolate frosting, add 1 cup of powdered sugar after it is all mixed up and fluffy. What kind of coffee do you use when you make the cupcake mixture? Just regular coffee.. or even decaf! I made these last night and they were a HIT! I did have quite a few problems with them though. The chocolate buttercream was rock hard when I took it out so using a big metal spoon to break it up is your best bet, though time consuming. I put it in my stand mixer and beat the tar out of it until super light in color and fluffy. The caramel frosting gave me some problems too. I made the caramel and let it cool, added the confectioners sugar and it was incredibly gritty. It tasted like I was crunching on raw granulated sugar. I figured with the chocolate frosting it mask some of it and it sort of did. Another problem, when I bagged up the frosting (easiest way I have found when doing two different colors or flavors is to put each into two different disposable bag, snip off the tips and put them in a larger piping bag fitted with a tip. Works like a charm, every time.) even though I beat the ever living tar out of the chocolate frosting there were still large streaks of butter that clogged my tips. Disappointing, the first few with a star tip looked AMAZING! I had to take it apart and fit it with a round tip that the butter could move easily through. The caramel center was the best! People were looking at me wide eyed like they received a PRIZE! Like giddy little kids, “OHHHHH CARAMEL CENTER!” All in all the cupcakes were a hit, I (personally) didn’t like the grittiness of the caramel or the chunks of butter in the chocolate frosting. For some reason the caramel filling didn’t come out. When cooled, the caramel set up too thick to spoon into the cupcakes, but not as hard as caramel candy. Also, it looked like the butter separated out of the caramel. I’ve tried other caramel recipes and this has never happened to me before. Any ideas? Thanks! These look INCREDIBLE! My daughter in law wants me to make a cake for wedding shower but I think this will be perfect! How far in advance do you think the cupcakes could be made & stored? I can frost day before. Thanks! !